Finally, achieve the modern look you’d always wanted with this Edge Dining Table, that promises an intimate dinner for two or four, gathered around this elegantly understated piece. 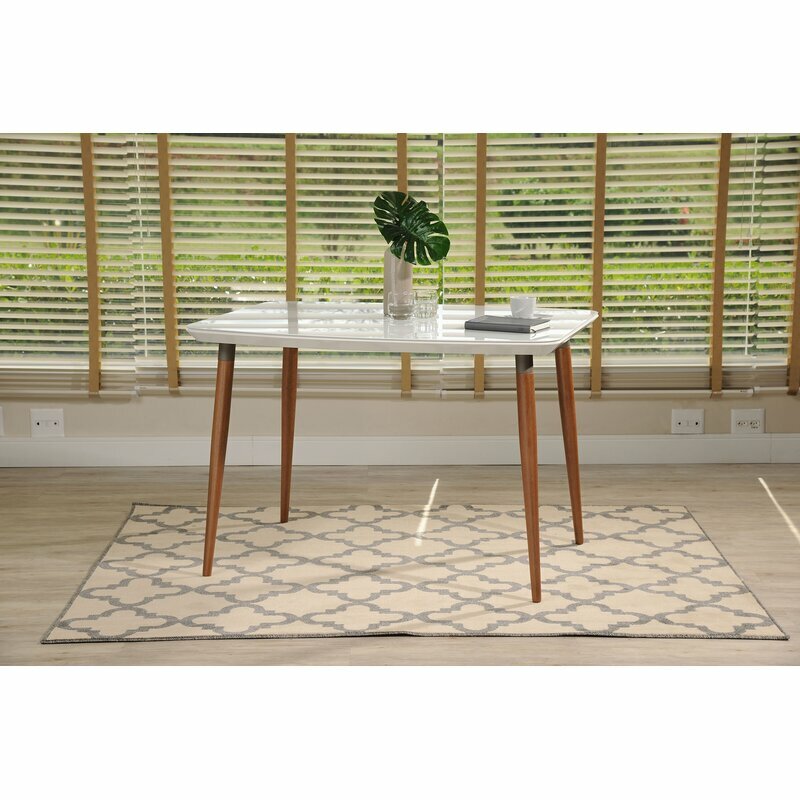 Beautiful oak legs play on the Mid-Century style and seamless lines add versatility and keep this table transitional, easy to blend with any space or existing decor. Add an intricate vase and artisan dishes for a perfect pairing. Blending the warmth of classic rustic styles with the chic appeal and convenience of modern aesthetics, Union Rustic gives you the best of both worlds. Whether you’re outfitting a slope-side ski cabin or adding a touch of charm to your city apartment, find the perfect piece for any living space. When you buy a Union Rustic Tasker Live Edge Dining Table online from Wayfair, we make it as easy as possible for you to find out when your product will be delivered. Read customer reviews and common Questions and Answers for Union Rustic Part #: UNRS8038 on this page. If you have any questions about your purchase or any other product for sale, our customer service representatives are available to help. Whether you just want to buy a Union Rustic Tasker Live Edge Dining Table or shop for your entire home, Wayfair has a zillion things home. Based on 62,181 total reviews. I initially ordered the smallest size in this rug so I could sample the color, pattern and texture while considering whether or not to purchase the largest area rug. The soft gray/light beige coloring and subtle pattern were as expected and true to the pictures online. However, the rug was much thinner than expected and the texture not as soft as I had hoped for. I prefer the similar Olga or Claire area rugs, which feel more plush. Although we love the design, we were pretty bummed about 2 key things. The first is that on one side of the headboard the craftsmen missed the line by just a little bit & I noticed it immediately after putting the bed together. If you look at my photographs you can see why it is so very obvious. But due to the returns policy, returning it would be a nightmare. The 2nd issue is that the middle leg that holds the bed up can be seen underneath the bed when you walk into our room - and it's not stained the same color as the bed itself - it's raw wood, so now we have to take the time to dye it. Considering what the bed frame cost, we expected better. But the bed is very stable and it's beautiful otherwise. I absolutely love this entry way table. It is rustic and charming and one of a kind. I cant even count how many compliments I have received. What's ideal about it for me is that it's small enough to fit in the space that I wanted it to. Many console tables are very large and I was struggling to find one the right size. I will note that we had an issue with the first table we received being damaged. It seems to have been the fault of the carrier company and not the actual product. Wayfair was quick to respond and resolve the issue. When we received the new table, it was in great shape. Due to the distressed nature of the wood I do feel like it is more fragile then I would have expected. But truthfully, now that it is set up we have no reason to fuss with it. I think it will last us a long time. Awesome product. Really like the finish of these... not really like the description or picture on the website so trying to post a picture for a more accurate description. It's bright white with a almost a rough-sewn pattern in it. Not much distressing, but you could always add more with a few minutes of sanding. Pay attention to the outside measurements and the mirror measurements- was a bit smaller of an actual mirror than I was expecting bc I didn't pay attention tp those. The design itself is beautiful, I love rustic styles. But the problem is that it has a lot of big and deep cracks. They used really damaged timbers in this product. They are supposed to keep the wood in its natural shape, but using cheap and low quality materials is another story. On the other hand, it has a very bad chemical smell, specially when you open the cabinets. Because of the smell, the cabinets are not usable for me. At the bottom, there is a sign saying that it can cause cancer. We avoid touching it or we wash our hand immediately after any contact by it, so if you have kids or pets, it won't be safe for them. We are very pleased with this purchase. The bed is as described, and exceeded my expectations. At this price, I was afraid that it would be flimsy, but it is very sturdy. I wanted a solid wood bed with no veneers and this is it! It didn't take my husband long to put it together. There were not enough screws for every slat, so he went to our workshop and got some more. It may have a been fine without doing that, but we wanted to insure no squeaky sounds from slats not being screwed down. I looked for weeks to find the perfect solid wood platform bed and this is everything I wanted! Free shipping sealed the deal! I am using a 10" queen memory foam mattress and it fits perfectly! I can hardly wait to get the proper linens and other room decor! Redmond Entertainment Center for TVs up to 50"
We were very excited to find this style of table on line for the price. We originally going to buy one similar at living spaces but was going to cost us $1,000 more with tax & deleted very. The only thing is when we received it, the cognac color seemed a bit too dark than what's on line didplay. So I spoke to Jared S (customer service). He took the liberty to reach out to the watehouse. The warehouse took the time to take sample pictures of both the Cognac & espresso colors together. The espresso is almost black. The cognac colors vary since these tables are hand made from scratch. I think they should list the variable on line. So we decided to stay with our new diner table. It's solid easy to clean. Bad sofa. Average quality for upscale price. Sofa looks used and beat up from the get go. The cushions are not filled enough, and are too soft. Sofa arrived in bad condition with creases and pits in the leather surfaces, due to lack of proper fill and very poor shipping wrapping that squeezed the cushions very tightly. This sofa isn't worth more than $1,000. Not worth anything close to the price. Anchor your dining room in style, with this dining table, a quality and expertly crafted piece perfect for enjoying family gatherings and creating warm memories. The table comfortably seats four and is a standout piece. A symbol for family togetherness, home-cooked meals, and conversation, dining tables are a must-have for every home. And, with so many styles out there, you’re bound to find the piece that reflects your own unique personality. Take this table, for instance: Crafted from manufactured wood with solid wood veneers, this clean-lined table is founded atop four flared legs and features a neutral finish that won’t clash with your current color palette. Plus, it includes an extendable leaf to accommodate additional dinner guests. Add an element of nature into your home with this clever Dining Table. This modern furniture piece features solid rubberwood table legs with branching accent that provides extra support for the tabletop. The smooth tabletop is finished with a white powder coated finish for a clean look. This dining table strikes the perfect balance of modern design and convenient functionality. Whether planning for a quiet brunch, intimate dinner party, or used as a work table, this piece is well-crafted and beautifully made, including a 4mm glass table top to protect it, and space for four chairs to gather around it. Dress it up with creative seating, mix and match chairs, as this table blends well with any decor. Play hostess, tell your friends your cooking and show off your new sleek piece. Perfect for sharing in an intimate dinner for two or four, this Dining Table is a classy focal point for any dining area or kitchen. Beautifully crafted two-tone splayed wood legs, keep this piece durable and stylish. Select a glossy marble finish or creamy off-white tone for a seamlessly sophisticated look that will instantly transform your space. A symbol for family togetherness, home-cooked meals, and conversation, dining tables are a must-have for every home. And, with so many styles out there, you’re bound to find the piece that reflects your own unique personality. Take this table, for instance: The perfect pick for any mid-century-inspired space, it showcases an understated construction with four flared legs and a clean-lined tabletop. Crafted from a blend of solid and manufactured wood, it boasts a neutral two-tone color for a look that won’t clash with your current color palette. In keeping with the spirit of the need for versatility within the more modest of dining spaces, this collection provides function and style making it the perfect addition to your home. The modern and contemporary design is immediately discernible as you take in the collection’s profile. Stacking chairs allow for quick and compact storage, while the natural pine finish of the legs and gray or white finish of the table top, chair backs and seats lend to the contemporary styling. 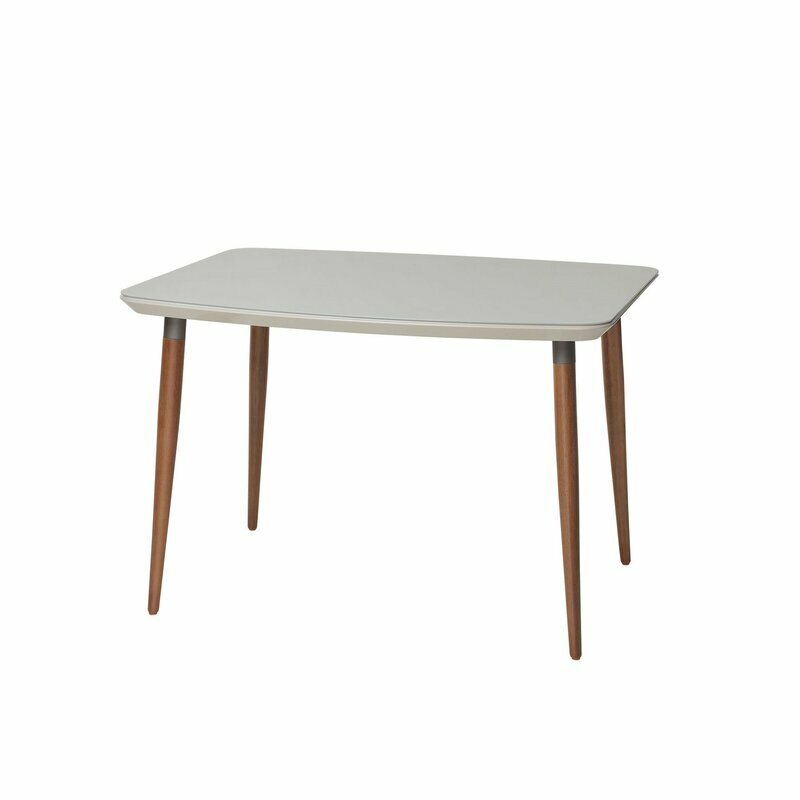 Elevate your space with this mid-century inspired Batu Dining Table. This is a solid ashwood legged dining table with a smooth white lacquer top and a minimalist vibe perfect for the contemporary dining room. Invite family and friends to gather around with a splayed and tapered wood leg table that generates ample legroom. Useful both as a dining table and writing desk, this collection is the perfect addition to the modern home. Rated 4 out of 5 stars.37 total votes. Your dining table is the spot where you and your family will sit down to share a meal, so it should deliver the perfect blend of on-trend style and plentiful space. A table like this, for example, is a great option for lending your dining ensemble a sleek modern look thanks to its angled legs and sleek silhouette. Crafted from solid ash wood, this piece features a two-tone finish thanks to its white, powder-coated surface that resists scratches and stains. Measuring 71'' L x 35.5'' W x 29.75'' H, this table comfortably seats up to six people.